The Neston and District Community Fund has topped the £50,000 mark for grants awarded since the fund was established. Set up in 2015, the fund specifically supports the work of community and voluntary groups in Neston, Little Neston, Parkgate, Burton, Ness, Willaston and Puddington. Recent success stories have included a £7000 contribution to Home-Start Wirral for a project aimed at extending the family support work from Wirral into Neston, to support Neston families through difficult times, leading to improved outcomes for both children and parents. The grant enabled an experienced part-time Family Support Coordinator to work an extra day a week in the Neston area to recruit and train a team of volunteers to support a minimum of 10 families over the 12 month period. A further £4000 was awarded to CHAPTER (West Cheshire) Limited last year for their wellbeing workshops, targeting isolated people in Neston with severe mental health diagnoses. The grant funded activity costs, room hire, refreshments, transport and small capital expenditure items for the activities. Original founders Phillip Bates & Co, Rightway and Guy Tilby Engineering, who have now also been joined by The Mitchell Motor Group, are looking for more donors – either businesses or individuals – to team up with them on the fund. Phil Bates, Principal at Phillip Bates & Co chartered accountants, said: “We are proud of the projects we have been able to support since we launched the Neston and District Community Fund, but we know there is so much more to do. The fund is administered by Cheshire Community Foundation, which works to match charitable donors with the causes that matter most in Cheshire and Warrington. Applicants can apply for funding from the Neston & District Community Fund but, if additional funding is needed, other CCF-managed funds may also be able to assist. If you would like to apply for a grant, please email angela@cheshirecommunityfoundation.org.uk or call Phil Bates on 0151 353 0003. Good planning is vital if business owners are to give themselves the best chance of success, according to a leading chartered accountant. Phil Bates, Principal of Cheshire and Wirral accountants Phillip Bates & Co, says that the businesses which put the best systems and processes in place are the ones most likely to succeed. Phil says business essentials should include good financial practices such as budgeting, forecasting and regular management accounts to allow for immediate and longer-term decision making. Having a business plan is also important although it needs to be a working document that can be easily updated rather than a lengthy tome that will gather dust in a drawer. Other examples of good practice include the development of a sales and marketing strategy with a clear understanding of customer groups and how best to engage with them. Phil, whose firm is based in Neston but works with clients across Cheshire, Wirral and North Wales, said: “I have been working closely with businesses for more than 30 years and there is simply no substitute for good planning. “Developing and executing robust plans, both financial and non-financial, within a business has never been easier. Modern technology allows business owners to access real-time information at the touch of a button. Phil said that many businesses remained reluctant to make investment into their companies, but that this would hopefully start to change in 2018. He added: “While businesses are right to be cautious given all of the economic and political uncertainty of the last couple of years, they also need to ensure that they aren’t storing up trouble for the future. Phillip Bates & Co and its sister firm, Phillip Bates & Co Financial Services, are one of only a small number of Chartered Partnerships in the region. Neston barbers ‘Style’ is marking a new era as the next generation steps in to run the family business. Style, founded by Tony Collins in 1980, has been transferred to daughter Emma Parry as her Dad retires from the business. Originating in Chester in 1980, Style relocated to Neston 3 years later, taking up residence first on Liverpool Road before moving to Bridge Street in 1990. Tony became known as the trusted village barber, attracting both men and women from the local area to his traditional salon. Now, Tony’s daughter Emma, whose career to date has seen her work in a number of office management roles, has taken the reins of the family business and has big plans for the company, including offering extended opening hours (Style is now open late-night Thursdays and on Sundays) and an enhanced social media presence. “We’re a well-known family business and many of our customers have been coming here for years,” Emma said. “But I am also looking to shake things up a little bit! 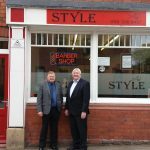 Since relocating to Neston some 33 years ago, Style has been a client of local Chartered Accountants Phillip Bates & Co. In fact, they were one of owner Phil Bates’ very first clients when he came to Neston in the summer of 1983. Style founder, Tony Collins, said: “The support of Phil and his team has really been invaluable to us over the years. “Choosing an accountant is a very personal thing. We love that Bates & Co is a family business with values very similar to ours. Emma also credits Phil and his team for their support in welcoming her into the role. “I’m very much learning and the team at Bates & Co have been a massive support. “The accounts in previous roles I’ve held have been very different. I feel happier and more confident knowing that the team at Bates are always there. I can pick up the phone and call whenever I need them. A chartered accountant has welcomed the Government’s decision to delay a vote on tax rises for self-employed workers until later this year. Phil Bates, Principal at Cheshire and Wirral accountants Phillip Bates & Co, says the announcement made in last week’s Budget came as a shock to many of his clients who run small and medium sized businesses in the region. Privately owned SMEs and landlords below the VAT threshold to get an extra year to prepare for Making Tax Digital and quarterly reporting. Phil, whose office is in Neston, said: “Small business owners must feel like they are being hit from all sides at the moment. Before the Budget they were facing the prospect of increases in business rates and the looming requirement for them to digitise their businesses by filing tax returns online each quarter. “Then, in this week’s Budget, they hear that the tax-free allowance on their share dividends is being reduced, while the self-employed will see their NI contributions rise. “All of this at a time when we are just a couple of weeks away from Brexit being triggered and the continuing uncertainty over the future direction of the UK economy. It is made even more unsettling by the fact the Government has clearly reneged on its manifesto promise not to increase NI contributions. “Business owners and the self-employed need the support of Government, not to feel as if they are being punished to help the Chancellor plug holes elsewhere in the public finances. Phil also welcomed the latest concession on the implementation of the Making Tax Digital policy, which will force SMEs to use digital tools, such as software or apps, to keep records of their income and expenditure. The announcement follows previous concessions at the end of January. These included allowing businesses to continue using spreadsheets to record receipts and expenditure, which they can link to software to automatically generate and send updates to HMRC. The Government further announced that free software will be available to the smallest businesses and that businesses “that cannot go digital will not be required to do so”. Phil added: “There remains a lot of ambiguity around the Making Tax Digital implementation. For example, they talk about businesses “that cannot go digital” being exempt, but what criteria will be applied to make this assessment? “Ministers keep telling us that under the current system over £8billion a year is not collected due to avoidable taxpayer errors and carelessness, but it has never explained how it has arrived at this figure. Any business wanting advice on changes announced in the Budget should contact Phillip Bates & Co on 0151 353 0003. The end is in sight for Business Premises Renovation Allowance (BPRA), which has assisted people looking to bring unused or derelict property back into use. BPRA can provide 100% relief for expenditure on converting or renovating unused commercial property for business use. The relief comes to an end on March 31, 2017, for companies and April 5, 2017, for companies. In order to qualify for the relief, a number of conditions had to be met including the area the property is situated, the person doing the work, and the subsequent use of the property. The types of expenditure that qualify for the relief are generous, including building work, professional fees and management fees as well as some plant and machinery. For further information, contact Phil Bates at Phillip Bates & Co, a Cheshire and Wirral firm of chartered accountants. 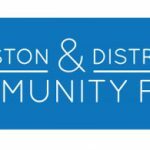 The Neston and District Community Fund wants to hear from charities and community groups leading vital social projects. The Fund, which was launched in 2015, particularly wants to hear from organisations tackling social issues such as youth crime, drug rehabilitation and elderly isolation. It was set up to specifically support the work of community and voluntary groups in Neston, Little Neston, Parkgate, Burton, Ness, Willaston and Puddington. Four businesses – Phillip Bates, Clive Watkin Partnership, Rightway and G Tilby Engineering – launched the fund with an initial substantial donation. They followed this up with a further donation in 2016. A number of grants have so far been given, the most recent one to Healthbox CIC, a not-for-profit organisation committed to delivering lifestyle change programmes in the community. The grant from the Fund will support the Neston Healthy Families project which works with families with multiple and complex needs. The six-month project supports families who have been identified by primary schools, Plus Dane Housing and Neston Children’s Centre. 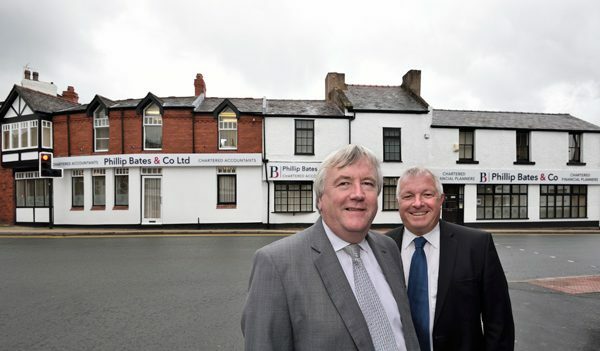 Phil Bates, Principal at Phillip Bates & Co chartered accountants, said: “We are proud of the projects we have been able to support since we launched the Neston and District Community Fund almost two years ago, but we know there is so much more to do. Business owners need to take action now if they are to be ready for a revolution in the way they file their tax returns, according to a leading chartered accountant. It is just over a year until the majority of businesses, self-employed people and landlords will be required to keep track of their tax affairs digitally and to update HMRC at least quarterly via their digital tax accounts. The transformation, called ‘Making Tax Digital’, will force SMEs to use digital tools, such as software or apps, to keep records of their income and expenditure. Phil Bates, Principal at Cheshire-based chartered accountants Phillip Bates & Co, said: “The legislation is due to begin taking effect from April 2018 which means the first digital tax return will be due in July of that year. “The changes should significantly improve the way companies manage their accounts and tax affairs and improve their ability to plan ahead and react to issues within their business. “For example, business owners will no longer have to wait until the end of the tax year to discover how much tax they need to pay. “But in order to comply with the ‘Making Tax Digital’ legislation will require the vast majority of businesses to introduce new technology and ways of working. “The team at Phillip Bates & Co has undergone training in many of the Cloud accounting software systems available to businesses. “We have already begun the process of advising and supporting our clients as they move across to this new way of working and will continue to do so throughout 2017. Phillip Bates & Co is based in Neston but works with SMEs across Cheshire, Wirral, Merseyside and North Wales. It is one of only a small number of Chartered Partnerships in the region offering both a chartered accountants and chartered financial planners with its sister company Phillip Bates & Co Financial Services. The vast majority of SMEs in Wirral and Cheshire have no appetite for lending, according to a leading accountant. Phil Bates, Principal of Neston-based chartered accountants Phillip Bates & Co, said the current economic uncertainty was to blame. Phil said: “Even though money is cheap to borrow at the moment, entrepreneurs have got little desire to go to the banks. “Given the continuing uncertainty following the Brexit vote, business owners do not have the confidence to invest as much as many would like to. Phil added: “If entrepreneurs are not willing to invest in their businesses, the implications are severe for the wider economy. The current safety first strategy means companies are not investing in new machinery and equipment, recruitment, skills training and all sorts of other essentials in growing the economy. “Some of my clients are considering exiting from their businesses five years earlier than would have previously been the case. In the case of family businesses, this means trying to bring through the next generation sooner than perhaps was planned. “The single biggest factor in making businesses reluctant to borrow is Brexit and the lack of a clear plan as to the direction the UK is heading. The latest SME Finance Monitor report revealed that just under half of businesses considered themselves to be “permanent non-borrowers”. Business owners should start planning now for sweeping changes to the way they file their tax returns, a leading accountant has warned. By 2020, the vast majority of businesses, self-employed people and landlords will be required to keep track of their tax affairs digitally and to update HMRC at least quarterly via their digital tax accounts. The Government initiative, called ‘Making Tax Digital’ will bring about the demise of the annual tax return. In order to comply with the new legislation, businesses will be required to use digital tools, such as software or apps, to keep records of their income and expenditure. The tools enable business owners to build a comprehensive view of their tax data, flagging up possible errors and offering prompts for information that may otherwise be overlooked. Phil Bates, Principal of Cheshire-based chartered accountants Phillip Bates & Co, said: “The new digital system will be implemented from April 2018 to 2020, but business owners need to start preparing now. “Some SMEs will already be using an online accounting system, but the majority will not and they need to start making the transition over the next 12-18 months. “The ‘Making Tax Digital’ initiative will revolutionise the way businesses manage their accounts and tax affairs and, ultimately, has the potential to streamline and make the whole process more efficient. For example, you will no longer have to wait until the end of the tax year to discover how much tax you need to pay. Phil, whose www.pbates.co.uk office is in Neston but works with SMEs across Cheshire, Wirral and North Wales, said: “We have begun trials with a small number of clients, moving them across to online software and implementing best practice into their businesses. “For some SMEs, the transition will be relatively smooth, while for others, including those still using pen and paper for their book-keeping, the process will take considerably longer. 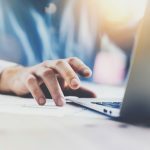 “I have had conversations with a small number of clients who are reluctant to move to digital accounting with a few saying it may encourage them to shut up shop.